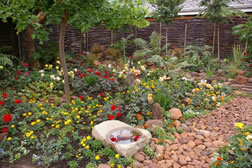 If you want the plants in your garden to thrive, then give the soil in which they grow some attention. Improving the soil in your garden will improve the health of plants and enable them to grow stronger, flower more prolifically, and be less prone to disease. Very few gardeners have the good fortune of having perfect soil. Life is a garden filled with healthy soil that is rich in organic matter, natural minerals, microbial activity and earthworms. 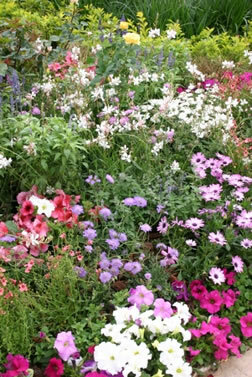 Fortunately there are ways of improving soil that will allow you to grow nutritious vegetables and beautiful flowers. Organic matter will help sandy soils retain moisture, and break up clay soil. Fresh manure can burn plants, so make sure that the manure you use is aged, dark in colour, and odourless. Compost improves and enables soil to better absorb water, thereby reducing the need to water. Instead of making regular trips to the local waste site, or paying garden services to remove green waste material, use this to make compost. The most successful compost is made by ensuring there is sufficient air, heat and moisture to create suitable conditions for micro-organisms. This is done by spreading green material (vegetable peelings, spent plants and lawn clippings) and dry material (fallen leaves, twigs and small branches) between layers of soil, so that the pile is not too compacted and air can circulate. There must be sufficient heat generated by decomposing material to kill off any pests, diseases and weeds, and this can only be done if each layer that is added is spread thickly, and the compost moistened after each layer is added. 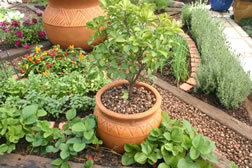 A basic concept of organic gardening is to feed the soil not the plants, whether by green manuring with living matter, or by mulching with dry material. Initially, a green mulch can cause nitrogen depletion in the soil, but this can be overcome by adding additional nitrogen. Soil can also be improved using the no-dig method. This is a year-round mulching system that eliminates most of the time-consuming part of gardening, namely weeding, feeding, watering and digging. Many different materials can be used as mulch; a 20cm layer of straw, any vegetable matter that will break down, leaves, vegetable peelings and weeds before they set seed, are placed on top of layers of wet (chemical free) newspapers. This mulch at first may seem excessive, but breaks down surprisingly quickly from being exposed to all weathers. A disadvantage to mulching is that it can become a snug hiding place for snails and slugs, but on the plus side, mulches encourage birds and small wildlife to forage for their dinner in this convenient larder. Soil is usually referred to as sandy, clay or loam, and of these, loam - which is a mix of large and small soil particles - will give the best results, only needing to have nutrients that were used up by plants replaced on a regular basis. To test what type of soil you have, take a handful of soil and squeeze it - sandy soil will not hold together, while clay soil will stick. Have large particles that drain rapidly and any nutrients tend to quickly leach out. Forking in generous amounts of compost and well-rotted manure each season before planting will benefit plants by retaining moisture and feeding the plants. Don't drain well and become sticky when wet. They need breaking up with compost and gritty material, such as river sand, to allow air, water and roots to penetrate.